Last Thursday, Mr Minx and I met up with my two best friends for an excursion to the Philadelphia Museum of Art to see the Frida Kahlo exhibition. Afterwards we had dinner at Cebu, on Chestnut Street in the old city. Originally a Filipino restaurant, Cebu has Americanized its menu but kept some Asian-style touches. 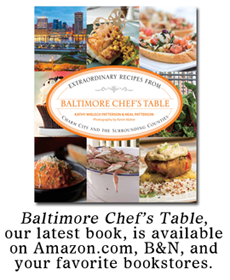 Their appetizer section is billed as "tapas," and consists of 21 protein-packed selections, all of which sounded tempting. One could order them individually, or as a "Trifecta" - any three tapas for $20, saving a dollar or so in the process. The four of us originally thought to order four Trifectas, thus tasting 12 different dishes, but Kate suggested we up the ante and go for five. See, we were used to tapas-sized portions being on the small side...not so at Cebu. Doggie bag city. 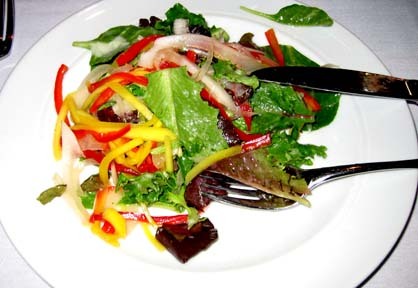 We all started off with the very nice Cebu Salad: Crisp Garden Greens arranged with a Slaw of Green Papaya, Mango, Peppers and Sweet Onions. Dressed with a Coconut Vinaigrette. The dressing made the salad with its pronounced coconut flavor. After the salads, the tapas started coming fast and furious. It was only 5pm and we were the only customers in the joint, so there was no delay in getting food to the table. Pan Seared Pork Loin - Tender Slices of Pork Simmered in Soy, Garlic, Rice Vinegar, Bay Leaf, Lemongrass & a Hint of Ginger Delicious. Mini Egg Roll - The Philippine Spring Roll. Ground Pork, Shrimp, Carrots, and Scallions, Stir Fried with Banana Sauce and Oyster Sauce. Crispy Fried and Presented with a Traditional Dipping Sauce. These lumpia got soggy as soon as they hit the sauce, but they tasted good anyway. Clams - Manila Clams Wood Roasted with Fermented Black Beans, Chorizo, Garlic, Ginger, and Wine. The clams were tiny but delicious. 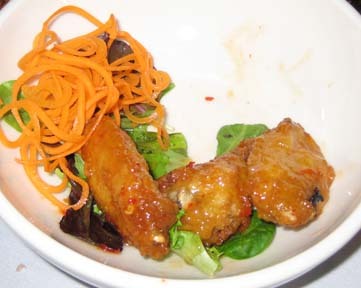 Krispy Ox Tail - Small Crispy Oxtails tossed with a Spicy Peanut Glaze and served with a Cool Mango Dipping Sauce. 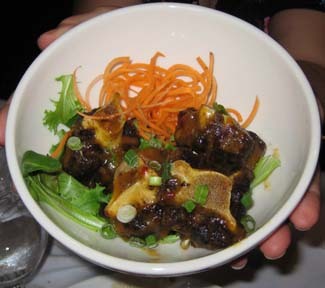 I don't think any of us had tried oxtails before. They were very intensely beefy. But not "krispy." And the dipping sauce was actually a glaze. Grilled Marinated Pork - Grilled Marinated Pork Tossed with Sweet Onions, Cilantro, & Scallions in a Garlic Soy Vinaigrette. This pork dish was fantastic. I wanted a bigger portion of it and a nice bowl of white rice. Crispy Wings - Plump Roasted Wings Slow Cooked in Adobo Sauce. Crispy, Fried & Glazed. I don't think these were slow cooked. Deep fried maybe. Not crispy because of the glaze, which was a little too sweet. Mussels - Mussels in a Shallot, Garlic & White Wine Sauce These were fairly simply prepared, so they were pretty tasty. Too bad we sent the bread basket away before we could mop up the juice. Krispy Calamari - Crispy Calamari Served with Sweet Coconut Chili I'm a sucker for fried calamari. These were a little on the chewy side. And what's with the lack of tentacles? Seared Beef - Marinated Beef Tossed with Sweet Onions, Garlic & Scallions served with Soy Vinaigrette Another one I'd happily eat as an entree with a bowl of rice. Seafood Croquette - Deep Fried Seafood Croquette Coated with Panko Bread Crumbs Served with Honey Cilantro Mustard This was the most disappointing thing we ordered. 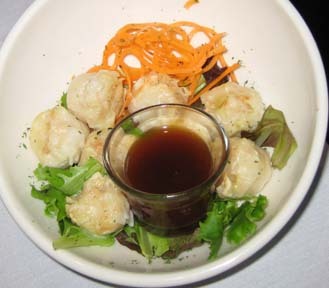 As you can plainly see from the photo, these are not croquettes at all but shumai. They were served with a sweetish soy dipping sauce. I at first thought that our waiter might have mixed them up somehow with the dumplings (which he suggested we not order) but another look at the menu shows that those are of the vegetable persuasion and served with a red pepper coulis. Curious, and not worth $7. 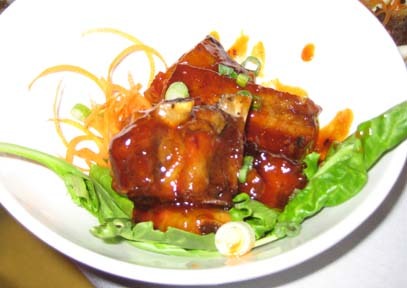 BBQ St. Louis Style Riblets - Cooked Adobo Style with Tamarind, Soy, Sugar, Vinegar & a Blend of Asian Spices. These were pretty good, if a bit too sweet. Krispy Combination - Sliced Braised Pork Belly, Chicken, & Longaniza Sauted with Onions, Peppers, & Scallions Tossed in a Light Mayonnaise Lime Sauce. Definitely the weirdest thing we ordered, it was like a hot chicken salad. Mr Minx and I really enjoyed it, particularly the bits of sausage. Kate and Andree, I think, considered it pretty gross. More for me! Krispy Pork Belly - Chopped Braised Pork Belly Tossed in Sweet Onions, Scallions & Cilantro Tossed in our Homemade Pate Vinaigrette. Pate vinaigrette? I didn't notice any pate flavors, but the pork belly was yum - tender meat and melting fat. Makes my mouth water just thinking about it. Shrimp Tempura - Tempura Style Crisp Shrimp Served with Sweet Ginger Sauce. 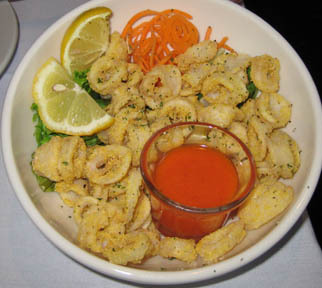 Standard tempura. Seemed weird not eating it with a soy dipping sauce and maybe some tempura sweet potatos and onions. 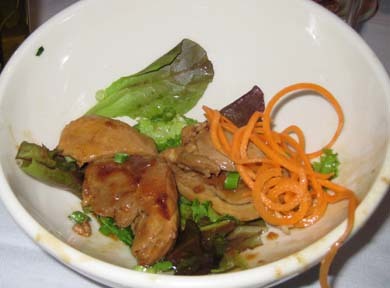 Marinated Chicken Adobo - Traditional Adobo Style Chicken in Soy, Garlic and Rice Vinegar. To tell the truth, I don't even remember what this one tasted like. After a while, everything ran together. It didn't help that everything was presented in identical white bowls with identical carrot shreds-and-lettuce garnishes - the reason I didn't photograph each dish that came out. We drank a nice Talus Pinot Noir with our food and opted not to get dessert. Something like tiramisu seemed completely inappropriate after such a heavy meal. 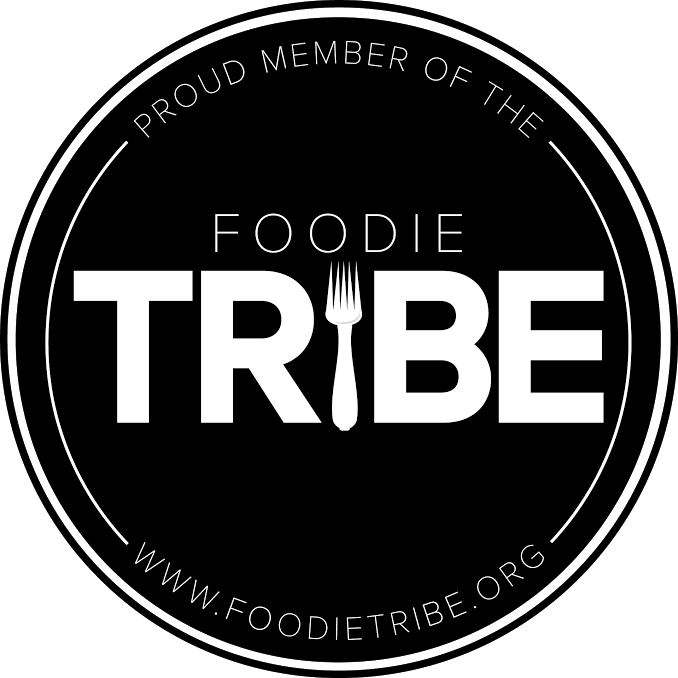 We had some forgettable dishes, but for the most part, I think we all enjoyed the food. Although there are dozens of other restaurants in Philly that I would like to visit, I'd eat at Cebu again. I'd definitely order the pork belly, and I might like to try the scallop and tofu tapas that we did not order this time.